Sunderland winger Boudewijn Zenden has signed a new one-year contract extension with the club. The 33-year-old former Netherlands international has struggled to break into the first team since arriving at the club from Marseille last October. 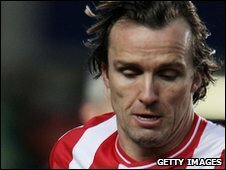 Zenden, who was out of contract this summer, has made only one league start while at The Stadium of Light. But the Black Cats have decided to take up the option of a further year's deal for the ex-Chelsea and Barcelona man. "I'm delighted Bolo has agreed to stay with us," said Sunderland boss Steve Bruce. "He has played at the top level for a long time and has a wealth of experience which is so valuable both on and off the pitch. "He has a great influence on his team-mates, and that is vital when you are bringing through the promising young players that we are." Zenden, who started his career with PSV Eindhoven, also played for Liverpool and Middlesbrough during his spells in England. He scored two league goals last season, including a stunning volley after coming on as a substitute in the 3-1 win over Tottenham.